CHARLESTON, West Virginia, January 20, 2014 (ENS) – West Virginia Governor Earl Ray Tomblin today proposed legislation to implement an above ground storage tank regulation program in West Virginia. The new measure attempts to rule out a repeat of the January 9 chemical spill into the Elk River that fouled drinking water for some 300,000 West Virginians. The spill of crude 4-methylcyclohexanemethanol (MCHM) occurred about 1.5 miles upriver from West Virginia Water American’s plant in Charleston. On January 9, Governor Tomblin declared a state of emergency, and activated the West Virginia National Guard. 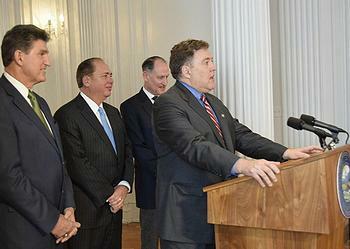 For the announcement, Governor Tomblin was joined by U.S. Senator Joe Manchin, who is a former governor of the state, and by state legislators Senate President Jeff Kessler and House Speaker Tim Miley. The legislation is intended to ensure that all above ground storage tanks are built and maintained consistent with required safety standards and require all public water systems to have written plans in place to prepare for emergencies, specifically in the event a contaminant is discharged in the water supply. In addition, the legislation will empower the Department of Environmental Protection to require all operators to self-report the location of all above ground storage tanks and detail on the construction and maintenance on each tank. It will also require written annual reports outlining any changes to on-site tanks. The legislation also requires annual inspections and certifications by professional engineers and allows the DEP to order a facility to take corrective action when storing material that may impact the health and safety of West Virginians. It requires facilities to submit individual spill prevention response plans for each on-site above ground storage tank and will permit the DEP to assess penalties for a facility’s non-compliance. The Do Not Use water advisory has been lifted for some areas affected by the spill, including all customers served by the Kanawha Valley Treatment Plant. Freedom Industries, the company whose tank leaked a corrosive coal-cleaning chemical into the Elk River, filed for Chapter 11 bankruptcy Friday. Chapter 11 allows a company to reorganize and continue operating. The company owes $3.6 million to its top 20 unsecured creditors, bankruptcy documents show. The company also owes more than $2.4 million in unpaid taxes to the Internal Revenue Service, and the IRS has placed at least three liens on Freedom’s property, demanding payment. The unpaid taxes date back to at least the year 2000, according to an IRS tax lien filed in 2010, the “Charleston Gazette” newspaper reports. The Chapter 11 filing puts a hold on all of the lawsuits filed against Freedom Industries. Since the leak, some 25 lawsuits have been filed against Freedom in Kanawha Circuit Court. The U.S. Government has also filed a lawsuit against the company. In Washington, three Democratic senators: Manchin and Jay Rockefeller, both of West Virginia, and Barbara Boxer of California who chairs the Environment and Public Works Committee, Friday reached agreement on legislative language intended to help protect Americans from chemical spills that threaten drinking water. This federal bill, the Chemical Safety and Drinking Water Protection Act, gathers in one place the tools to provide oversight of chemical facilities. It strengthens states’ ability to prevent chemical spills like the January 9th spill that contaminated the water supply in nine West Virginia counties and impacted more than 300,000 West Virginians. Senators Manchin and Boxer plan to introduce the legislation when Congress returns later this month. WASHINGTON, DC, January 20, 2014 (ENS) – TransCanada Corp will begin moving crude oil in its new 700,000-barrel-per-day Gulf Coast pipeline on January 22, according to the Canadian company’s CEO Russ Girling. The company is now filling the 485-mile Cushing, Oklahoma to Port Arthur, Texas pipeline with the three million barrels of crude oil needed before it can be placed into service. The Gulf Coast line is the southern portion of TransCanada’s Keystone XL project. The opening of the Gulf Coast pipeline will give Canada’s tar sands producers their first access to the refining hub at Port Arthur. Construction of the southern leg of the pipeline has been hotly contested by landowners whose properties TransCanada has taken by declaring itself a “common carrier” entitled to take land by eminent domaiin. This issue is still before the courts. Pipeline opponents still are hopeful that the Obama Administration will shut down the southern portion of the pipeline before it begins taking shippers’ oil. Tom Weis, president of the nonprofit Climate Crisis Solutions, was arrested protesting the pipeline in front of the White House on January 15. “Despite personally meeting with Vice President Joe Biden, White House Chief of Staff Denis McDonough and President Obama’s Special Advisor Valerie Jarrett, our request for a sit-down between the president and embattled Texas landowners was rudely and summarily ignored by the Obama White House,” says Weis. The northern portion of the Keystone XL Pipeline is a proposed 1,179-mile (1,897 km), 36-inch-diameter crude oil pipeline beginning in Hardisty, Alberta, and extending south to Steele City, Nebraska. Because it crosses the Canada-U.S. border, a Presidential Permit is required. The U.S. State Department is responsible for conducting an environmental assessment to inform President Barack Obama’s decision, but that assessment has twice been compromised by conflict of interest determinations and further allegations. 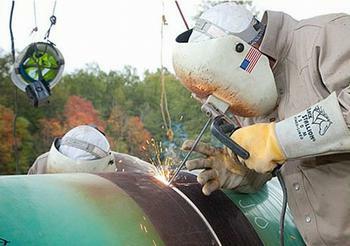 President Obama is expected to make a decision about the pipeline sometime in the first half of 2014. He has said he will reject the pipeline if it means a “significant impact” on the climate. Pipeline opponents argue that extracting, refining and burning the heavy crude oil of Canada’s oil sands would accelerate climate change. TransCanada points to a paper by Canadian climate scientists Andrew Weaver and Neil Swart of the University of Victoria published in the British journal “Nature Climate Change,” which found that even if every barrel of oil in Canada’s tar sands is produced, it would result in a cumulative global warming impact of 0.6 degrees Fahrenheit. More than five years after the initial permit filing, President Obama’s decision is still pending. SACRAMENTO, California, January 20, 2014 (ENS) – California’s environmental law no longer protects the environment or wildlife from the effects of the state’s responses to the current severe drought, after Governor Jerry Brown’s emergency drought declaration Friday. In the language of the declaration is a clause that exempts state agencies from compliance with the California Environmental Quality Act, CEQA, which is codified in the state’s Public Resources Code, starting at Section 21000. While these directives appear to protect the environment, in fact, the declaration suspends the California Environmental Quality Act. It’s bright and sunny across California, with no rain yet this month and none forecast for the remainder of January. California experienced the driest year in its recorded history in 2013, and the continental United States had its hottest year on record in 2012. As a result, California is seeing the effects of climate change. Firefighters are tackling wildfires in dry areas of the state. The snowpack in the Sierra Nevada Mountains has reached record lows. The historically low snowpack is contributing to falling water levels in reservoirs and lakes throughout the state. Governor Brown has called on Californians to cut their water use by 20 percent. Environmentalists say the governor should also call a halt to the oil and gas industry’s practice of hydraulic fracturing, which involves the injection of a mixture of chemicals, sand and water under high pressure into shale rock, fracturing it to release hydrocarbons. Governor Brown recently signed a measure into law that will impose some regulations on fracking but will allow fracking to continue in the state. road that environmentalists warn will have widespread impacts on rivers, streams and wetlands throughout north and west Jefferson County. Birmingham is the county seat of Jefferson County. In his January 18 ruling, U.S. District Judge Keith Watkins said that Black Warrior Riverkeeper, the environmental group seeking the injunction, did not prove its claims. “Delaying construction would have significant financial impacts on Defendants and the public treasury, especially if the bid process has to be repeated,” ruled Judge Watkins. The Southern Environmental Law Center filed the lawsuit on behalf of Black Warrior Riverkeeper, claiming that the U.S. Army Corps of Engineers failed to follow requirements of the Clean Water Act and the National Environmental Policy Act. “Proper analysis required by law would show that this project’s significant environmental impacts are not justified by its costs,” said Sarah Stokes, one of the Southern Environmental Law Center attorneys on the case. SELC says the Beltline will cost over $104 million per mile, money that Alabama does not have. The overall cost of the Beltline will be $5.4 billion, according to the FHWA, over $1 billion more than it would cost to address I-65, I-20/59, Highway 280, and ongoing maintenance and improvements for at least 50 other major highways and connections, according to the SELC. The environmentalists argued that the Corps chose to evaluate impacts and issue a permit only for a small 1.86 mile segment of the project between Hwy. 75 and Hwy. 79. WASHINGTON, DC, January 20, 2014 (ENS) – The U.S. Federal Transit Administration has a new Low or No Emission Vehicle Deployment Program (LoNo) that aims to put the next generation of advanced, non-polluting transit buses on the nation’s roads. FTA says it will bgin by awarding $24.9 million in LoNo funds on a competitive basis to transit agencies and state transportation departments working either independently or jointly with bus manufacturers already making low-emission and zero-emission buses. 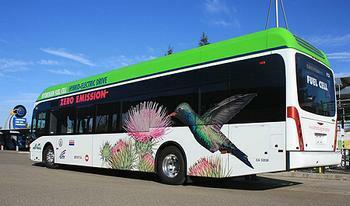 The funding is targeted to foster the widespread adoption of reliable “green energy” buses into transit fleets. Of the $24.9 million available in LoNo grant funds, $21.6 million is for buses and $3.3 million to support facilities and related equipment. The FTA’s LoNo program focuses on commercializing the cleanest and most energy-efficient U.S.-made transit buses to help reduce emissions like carbon dioxide and carbon monoxide. The LoNo program builds on the success of FTA’s National Fuel Cell Bus Program, which invested in the research, development and testing of alternative fuels and related equipment, such as electric charging stations, for the transit industry. This program committed $90 million over seven years for innovative research, demonstration, and deployment projects to reduce the cost of fuel cells for transit use. The program received its final funding in FY2013.